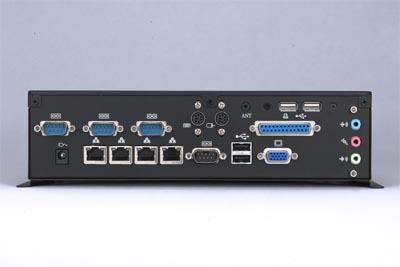 COMMELL's CMB-565 is a compact 5.25" drive-size embedded multiple Ethernet platform based on VIA Eden V4 1.0 GHz low power CPU, and offers the Realtek PRO/1000 GbE and four Ethernet interfaces for industrial multiple Ethernet application, such as firewall, VPN and all-in-one server solution. The CMB-565's compact size, fan free operating, bootable CompactFlash socket also provide the suitable hardware solution for the small business / SOHO firewall / VPN market and all-in-one internet server application. Key/Mouse , Line-In / Mic-In / Line-Out , 1 x Antenna .